Pictures sent in (January 2006) by Terry Guinn and Chris Childers of Drum Furniture Factory of Springfield, Missouri of their novelty coffee table. Great idea Terry and Chris, and great craftsmanship! As stated from Drum Furniture Factory, this table (we know what it really is), will be given to Neil Peart (drummer for Rush) in the near future. 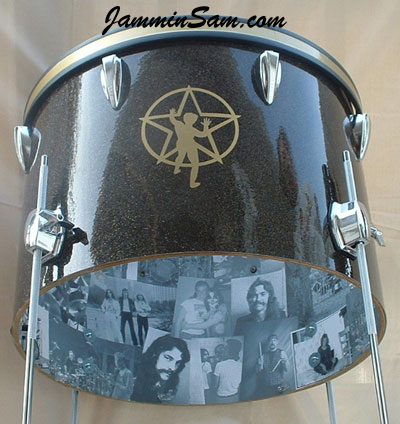 Inside the drum are pictures of Neil and others through out his career. 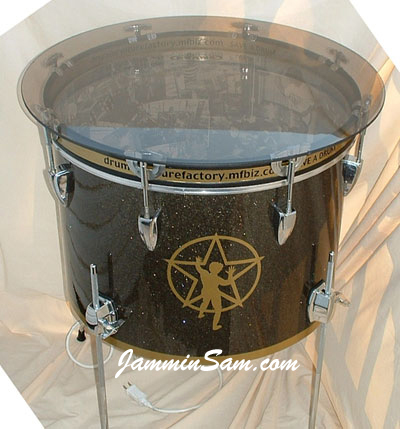 Dear Jammin Sam, We at Drum Furniture Factory would like to say thanks for your help with the drum wrap we received from you. It made the finished product look wonderful. Enclosed you will find some pics of the drum we wrapped with your product. We would also like for you to visit our website and let us know what you think of it. Once again we would like to say THANKS and when the time arises again will we call Jammin Sams for our needs.